"When we are Very Young"
The Center for Family Development is Western New York's attachment center specializing in the treatment of adopted and foster families with trauma and attachment disorder. Our professionals have the knowledge, skills, personal experiences, and professional training to help adoptive and foster families with attachment concerns. The Center for family Development has focused much of its efforts on helping adoptive and foster families. The needs of adoptive families are unique and very few professionals understand these families and their special problems. The Center for Family Development was founded by Dr. Arthur Becker-Weidman to provide answers to questions, solutions to problems, and the expert support necessary for families to thrive in these turbulent times. Dr. Arthur Becker-Weidman and his associates are dedicated to helping adoptive families achieve their potential. All members of the Center For Family Development are licensed, skilled, and highly trained professionals with at least twenty years experience helping families. Arthur Becker-Weidman, CSW-R, PhD. DABPS received his doctorate in Human Development from the University of Maryland, Institute for Child Study. He achieved Diplomate status from the American Board of Psychological Specialties in Child Psychology and Forensic Psychology. He is a member of the American College of Forensic Examiners. Dr. Becker-Weidman has received extensive training in Dyadic Developmental Psychotherapy, an attachment-based therapy, including with Daniel Hughes, Ph.D., author of Building the Bonds of Attachment and Facilitating Developmental Attachment. 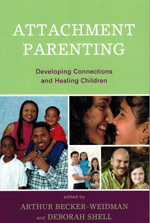 At the Center For Family Development we only begin working with families after completing a thorough assessment. We carefully evaluate the child and the family. Our success rate is now over 95%. Success means that the child has developed the capacity to love and be loved and is functioning at least at about 80% of the level you'd expect for a child that age. See our Research page for the results of our follow-up study. Dyadic Developmental Psychotherapy, an attachment-based therapy is an evidence-based treatment for children with Trauma-Attachment Disorders, Reactive Attachment Disorder, and other disorders of attachment that are complicated by severe trauma or histories of maltreatment. Other forms of treatment such as play therapy are ineffective with children who have disorders of attachment and complex post-traumatic-stress-disorder because all these therapies require a trusting relationship between the therapist and child. See our follow-up study in Child and Adolescent Social Work Journal, a professional peer-reviewed journal. 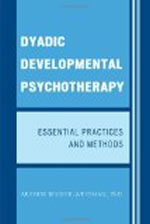 This demonstrates that Dyadic Developmental Psychotherapy is an evidence-based effective treatment for children with Reactive Attachment Disorder. Please see our Informed Consent document for more information. Parents of attachment disordered children experience a high level of stress and need support and understanding in order to help their children and survive as a family. The Center for Family Development offers a support group which is intended as an opportunity for parents to share parenting strategies, learn about approaches that work, support others, find support, and develop cooperative respite arrangements. This is not a treatment group or therapy. Dr. Becker-Weidman presented Grand Rounds at the New York University Medical Center in New York City on November 9, 2012. This is an hour long presentation, titled, "Complex Trauma and its Effects on Child Development." In this presentation you will hear Dr. Becker-Weidman describe what Developmental Trauma Disorder is, how it affects child development, and then describe an evidence-based, effective, and empirically validated treatment: Attachment-Focused Family Therapy. After presenting Grand Rounds at the New York University Medical Center on "Complex Trauma and its Effects on Child Development," Dr. Becker-Weidman was interviewed by Judith Joseph, MD, MBA, Child and Adolescent Psychiatry Fellow at the Child Study Center in New York City. In this five minute interview Dr. Becker-Weidman explains how chronic early maltreatment affects child development. 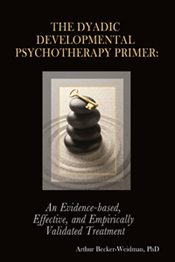 ATTACHMENT-FOCUSED THERAPY This video about attachment-focused therapies, such as Dyadic Developmental Psychotherapy, by the Association for the Treatment and Training in the Attachment of Children presents some of the most current material about evidence-based effective methods for treating disorders of attachment. Several internationally recognized experts describe some of the common elements of attachment-focused therapies. ATTACHMENT DISORDER: DIAGNOSIS AND TREATMENT This video about the Diagnosis and Treatment of Reactive Attachment Disorder by the Association for the Treatment and Training in the Attachment of Children. This video presents the most current material about the diagnosis and treatment of Reactive Attachment Disorder. In addition to Dr. Becker- Weidman, several other internationally recognized experts on on the video including Dr. Michael Trout and Dr. Richard Kagan.